If you are asking yourself “what are the different types of cash registers?” then you have come to the right place. CBE have been the exclusive national distributor for Casio entry level cash registers and cash register systems in Ireland for over three decades. 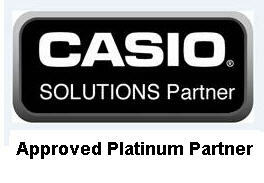 As the only Casio ‘Approved Platinum Partner’ in Ireland, CBE is proud to offer a broad range of Casio solutions that will suit all business sizes. Our entry level Casio systems are compact and stylish, with high-visibility LCD displays, and come with a help function and numerous easy to use features. They are suited to various types of retail and hospitality transactions. We are delighted to offer two new lines of electronic cash registers that have been added to the Casio range – the SE-C3500 and the SE-S3000. Our entry level Casio cash register can be purchased directly from CBE’s online eCommerce site: www.ShopCBE.com Alternatively if you are a business owner, contact us to speak with one of our consultants. They will be happy to discuss everything from our most basic cash register; to the more advanced cash management solutions that include computerized point of sale, credit card based systems and all other suitable point of sale systems for your retail business.